A darling of fortune, one who undeniably drew a “lucky number” in life, and who, it appears, is well ahead of his time, Filipp Rukavishnikov also inherited a heavy burden of fame: a kind of counterweight to complement the dynastic load shouldered by everyone born into the family. The 1st International Beijing Art Biennale was an audacious debut worthy of competition with such famous international cultural events as the Biennale di Venezia, the Kassel documenta, the FIAC contemporary art fair in Paris, and the Chicago International Exposition of Contemporary and Modern Art. It was the first time that such a large-scale, long-term cultural initiative to create a new international forum of contemporary art had been attempted in Asia. Many a creative genius of 20th-century art was overshadowed by the two great Spaniards - Salvador Dali and Pablo Picasso. Nobody was discussed, disputed or written about as much as they were; no other artist's work was covered as extensively as that of these two titans in books, albums, brochures and articles. ZURAB TSERETELI'S CONTRIBUTION TO WORLD ART IS ENORMOUS. THE SCOPE OF HIS ARTISTIC PURSUITS IS ALL-ENCOMPASSING AND MANIFESTS ITSELF IN MONUMENTAL AND EASEL WORKS, DESIGN AND APPLIED ART. TO SAY "HE EXISTS IN ART" WOULD BE WRONG - ART LIVES THROUGH HIM, HIS SOUL, HIS THOUGHTS AND HIS LIFE. THE POET ILYA REZNIK GAVE AN ACCURATE, VIVID AND COMPREHENSIVE ASSESSMENT OF THE MAESTRO'S CAREER IN ART, WHICH IS MARKED BY HIS FORMIDABLE TALENT AND INFINITE INDUSTRIOUSNESS: "IT WAS NOT THAT THE ARTIST CHOSE PAINTING - PAINTING CHOSE HIM." THIS POETIC EXPRESSION DESCRIBES AN ARTIST OF GREAT AND WIDE-RANGING GIFTS, TO WHOM, TO QUOTE ANOTHER POET, VALERY BRYUSOV, "ONLY WORK BRINGS HAPPINESS... LONG HOURS OF HARD WORK". TWENTY CHAPTERS, OR TWENTY ACTS OF AN UNFINISHED PLAY ABOUT ARTISTIC LIFE WHICH THE GERMAN ARTIST GUENTHER UECKER IS DESTINED TO COMPLETE HAVE BECOME A CULMINATING EVENT IN BERLIN'S CULTURAL LIFE FROM MARCH TO JUNE 2005, ALONGSIDE THE EXHIBITION "NEFERTITI" IN THE KUNST FORUM, AND A CELEBRATION OF THE CENTENARY OF ALBERT EINSTEIN. THE RETROSPECTIVE EXHIBITION OF THE PROMINENT MASTER WHO GAINED WORLDWIDE RECOGNITION IN THE 1960S WAS DISPLAYED IN THREE LOCATIONS -THE MARTIN GROPIUS BAU, THE NEW NATIONAL BERLIN GALLERY, AND THE "NEUER BERLINER KUNSTVEREIN" (THE NEW BERLIN UNION OF ARTISTS). ALL THREE WERE PART OF A TRIBUTE MARKING UECKER'S 75TH BIRTHDAY. Running at Florence's Palazzo Strozzi until the end of January 2013, the exhibition "The Thirties. The Arts in Italy Beyond Fascism" features artists who came to public notice after exhibiting at the Venice Biennales during Italy's Fascist era. It provides an opportunity to cast a fresh look at the artistic culture of this tragic historical period of European civilisation in the 20th century – one with regard to which there has been little variance of opinion to date among its interpreters and judges. 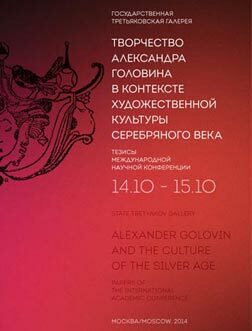 This Russia-Switzerland special issue of the “Tretyakov Gallery” magazine is dedicated to the cultural ties between our two nations. With its alpine landscapes, ancient cities, age-old castles, picturesque meadows, and Lake Geneva and its surroundings, Switzerland has long enchanted poets, artists and musicians alike with its romantic, soulful spirit. All Is New, and All Is Exciting! Like many of his compatriots, the painter Nicolai Fechin (Feshin) (1881-1955), following the 1917 October revolution, emigrated from Russia. A similar fate awaited Konstantin Somov, Konstantin Korovin, Mikhail Larionov, Natalya Goncharova, Marc Chagall, Yury Annenkov, David Burliuk and hundreds of other Russian artists, musicians, writers, actors and philosophers. Even as emigres, however, these people did not lose their connection with Russia's culture and traditions, remaining faithful to their historical roots throughout their lives. On 9 March 2012 Viktor Popkov, who died tragically early in November 1974, would have marked his 80th birthday. A graduate of the Surikov Art Institute, Popkov became one of the brightest and most remarkable artists of his generation, and his name and work has a permanent place in the history of the fine arts of the mid- to late-20th century. The very concept of American art in the 20th century brings a splash of emotions associated with the likes of Jackson Pollock, Claes Oldenburg, Andy Warhol, Mark Rothko, Robert Rauschenberg, James Rosenquist, and George Segal – the masters of abstract impressionism, pop-art and hyper-realism. However, American art in its full diversity is not limited to these great names: o my mind, Edward Hopper and Andrew Wyeth are the most "American" – in both spirit and individualism – of the artists of the past century. The retrospective exhibition of Edward Hopper (1882–1967) which will run until October 2004 in the Tate Modern Gallery, London, is another chance to raise such intuitive speculations. Dmitry Ikonnikov, through the breadth of his perception and his deeply personal feeling and understanding of the nature of art, as well as his professional experience and unarguable talent, has achieved a remarkable freedom of expression. He has created a unique figurative language, which is marked by the harmonic invariance of the form and content of his work. The large and most comprehensive retrospective entitled “The Bauhaus. A Conceptual Model” celebrates the 90th anniversary of the founding of this famous school of design, architecture, fine and applied art known for its reformatory ideas and aims and the international composition of its teachers and students. The exhibition opened in Berlin at the Martin-Gropius Bau, where it ran from 22 July to 4 October 2009, and can be seen at MOMA in January 2010 in New York. Organised by the joint efforts of German and American art historians, culturologists and archivists, this show represents the whole multi-sided heritage of the Bauhaus masters, their theoretical and practical experiments and discoveries. The scientifically argued concept of the organisers provides a rare opportunity to examine in detail a conflicting and complex evolution, the turning of a triad of geometrical figures and colours into a new aesthetics of artistic images, in architecture, the visual arts and design. Maximalism distinguishes a true artist from a craftsman. Iulian Rukavishnikov was a maximalist because he had both great personality and great talent, and the highest level of professional culture. He undoubtedly belongs to the host of brilliant 20th-century artists who set him on the path of innovation. Rukavishnikovʼs artistic legacy is as important as that of Henry Moore and Giacomo Manzù, Constantin Brâncusi and Alexander Archipenko. In modern culture, Zurab Tsereteliʼs art rightfully occupies a special place of honour. His art speaks of the masterʼs grand, multifaceted personality and personal zeal. The descendant of an old princely dynasty has kept the sense of the honour and valour of his ancestors, and the customs and traditions of the Georgian people; his creative work is a seamless marriage between the originality of Georgian national culture and the experience of Russian and international art. The art of one of the most remarkable and brilliant Russian sculptors Anatoly Andreevich Bichukov is an example of spiritual self-sacrifice, selfless devotion to art, and the epitome of the good and the beautiful. For nearly 50 years he has been putting his talent and sense of purpose in the high service of art. A graduate of the Moscow State Art Institute, now the Surikov Art Institute (MGAKhI), where he became a dean several years ago, Bichukov, as early as his college days, won reputation as a singular personality passionately dedicated to art. Tair Salakhov is rightly ranked among the brightest and most significant personalities of the Soviet art world – his work, representative of a whole era in culture due to its magnitude, spiritual richness, imagery, aesthetics and complex metaphors, has fittingly blended with new times, and modernity. Giacomo de Pass's first exhibition took place when he was 18, and he won acclaim at once. Since 1960 his works have been displayed together with those of Salvador Dali, Marc Chagall, Joan Miro, and Pablo Picasso. De Pass has had more than 100 solo shows at the most prestigious galleries and museums all over the world. The “Mes Passions” exhibition at the Tretyakov Gallery (in the Tolmachy exhibition hall) features the artist's paintings, drawings and sculptures created over the last 30 years. The Tretyakov Gallery show commemorates the artist's 70th anniversary. The art of Alexander Sitnikov is an astonishing aggregation of emotions and thoughts that provoke in viewers’ minds complex and contradictory reactions. The meta-language of his art is predicated on the multi-polarity of the artist’s attitudes to reality which does not correspond to the master’s idealistic belief in the harmoniousness of the universe and the imperishability of the spiritual principles of religious teachings and commandments. Because he is in a state of perpetual conflict with the reality around him and with a society of double standards, the conceptual basis of the artist’s imagery is dominated by the mythological component. A first-time viewer, looking at recent works by the Moscow artist Olga Bulgakova, would barely imagine what she made at the beginning of her creative career. In retrospect, it becomes obvious how consistently and inherently logically her overall comprehension, perception and understanding of the essence of being have evolved. The contemporary critics and art studies focusing on so-called “actual art” tend to employ a very subjective and limiting approach towards the legacy of 20th century Russian artistic culture. The nature of such an approach raises many questions for the theorists and historians of the new “generation”. On the one hand, they strive for a conceptual formal analysis and assessment of the trends and events of the past and, on the other, they often use quite opposite means and methods of studying culture by relying on social and political aspects in research of the artistic process, and thus excluding its specific characteristics, uniqueness and self-sufficiency. A personal exhibition of Max Beckmann (1884-1950), on show in the Old National Gallery in Berlin from December 2005 to March 2006, allowed many visitors to rediscover the universe of one of the brightest representatives of German art of the first half of the 20th century. Twenty chapters, or twenty acts of an unfinished play about artistic life which the German artist Guenther Uecker is destined to complete have become a culminating event in Berlin’s cultural life from March to June 2005, alongside the exhibition “Nefertiti” in the Kunst Forum, and a celebration of the centenary of Albert Einstein. IT WAS A LONG PROCESS OF ANXIOUS EXPECTATION RUNNING OVER ALMOST TEN YEARS TOWARDS THE EXHIBITION "BERLINMOSCOW. MOSCOW-BERLIN. 1950-2000". FINALLY CAME THE HAPPY MOMENT OF ITS OPENING, SEPTEMBER 28, 2003 WHICH TOOK PLACE IN THE CAPITAL OF THE FRG, IN MARTIN-GROPUIS-BAU. 500 WORKS BY 180 ARTISTS REPRESENTED NOT ONLY RUSSIA AND GERMANY, BUT ALSO SOME OTHER EUROPEAN COUNTRIES AND AMERICA - IN ORDER TO DEMONSTRATE DIRECT PARALLELS BETWEEN THE EAST AND THE WEST. It is more than natural to start any article on any international event in China with a quotation from Confucius: this piece on the First International Beijing Biennale is no exception. The famous Chinese philosopher and poet managed to formulate in his peculiarly Asian-Chinese paradoxical way the contradictory nature of some natural phenomena. He said: "Sometimes there are sprouts, but they do not blossom; sometimes they blossom, but bring no fruit". It hints at what fruit the First International Beijing Biennale might bring.